The Peacekeeper missile is America's newest intercontinental ballistic missile. Its deployment fulfilled a key goal of the strategic modernization program and increased strength and credibility to the ground-based leg of the U.S. strategic triad. With the end of the Cold War, the U.S. has begun to revise its strategic policy and has agreed to eliminate the multiple re-entry vehicle Peacekeeper ICBMs by the year 2003 as part of the Strategic Arms Reduction Treaty II. The Peacekeeper is capable of delivering 10 independently targeted warheads with greater accuracy than any other ballistic missile. It is a three-stage rocket ICBM system consisting of three major sections: the boost system, the post-boost vehicle system and the re-entry system. Peacekeeper missile also called MX, U.S. intercontinental ballistic missile (ICBM) that entered service in 1986.Under development from 1971, the MX (for "missile experimental") evolved into a 71-foot (22-metre) ICBM with a "bus," or fourth stage, located in its front end that carried 10 or 12 independently targetable thermonuclear warheads. This endowed each missile with several times the firepower of the two- or three-warhead Minuteman III, which it was designed to replace. In addition, the MX's extremely accurate guidance--an inertial system capable of being updated in flight by signals from navigation satellites--gave its 300-kiloton warheads greater potential to destroy reinforced missile silos and command bunkers in the Soviet Union. The MX had a range of approximately 7,000 miles (11,000 km).In order to be able to evade attack by Soviet ICBMs, which lagged behind U.S. ICBMs in accuracy but were far more powerful, several types of bases for the MX were proposed. These included launching by air from huge transport jets, "deep basing" in silos located more than 1,000 feet (305 m) underground, shuttling the missiles continuously on trucks or rail cars among "multiple protective shelters," and grouping silos close together in a "dense pack," so that incoming nuclear warheads would destroy or deflect one another. All of these modes proved to be prohibitively expensive, and none was politically popular; in 1983 it was decided to place the missiles in Minuteman III silos. Although plans called for 100 Peacekeepers, only 50 were authorized for deployment at Warren Air Force Base, Wyoming. LGM-118A Peacekeeper The Peacekeeper missile is America's newest intercontinental ballistic missile. With the end of the Cold War, the US has begun to revise its strategic policy, and has agreed to eliminate the multiple re-entry vehicle Peacekeeper ICBMs by the year 2003 as part of the Strategic Arms Reduction Treaty II. The Peacekeeper (designated LGM-118A) is a four-stage intercontinental ballistic missile capable of carrying up to ten independently-targetable reentry vehicles with greater accuracy than any other ballistic missile. Its design combines advanced technology in fuels, guidance, nozzle design, and motor construction with protection against the hostile nuclear environment associated with land-based systems. The Peacekeeper is much larger than Minuteman, over 70 feet long and weighing 198,000 pounds. It is a four stage missile like the Minuteman III, with the first three stages being solid propellant and the fourth stage bu hypergolicly fueled with hydrazine and nitrogen tetroxide. Although capable of carrying eleven Mark 21 RVs, treaty limits mandated deploying the Peacekeeper with only ten RVs. The entire missile is encased in a canister in the silo to protect it against damage and to permit "cold launch". The Minuteman II and III ignite their first stage engines while in the LF, but the Peacekeeper is ejected by pressurized gas some fifty feet into the air before first stage ignition. The Peacekeeper is a three-stage rocket ICBM system consisting of three major sections: the boost system, the post-boost vehicle system and the re-entry system. The boost system consists of three rocket stages that launch the missile into space. These rocket stages are mounted atop one another and fire successively. Three of the four stages exhausted their solid propellants through a single adjustable nozzle which guided the missile along its flight path. Motorcases made of kevlar epoxy material held the solid propellants. The fourth stage post-boost vehicle employed a liquid bi- propellant rocket propulsion system to provide velocity and attitude correction for missile guidance. The post-boost vehicle also employed a self-contained inertial navigation system that allowed the missile to operate independent of ground reference or commands during flight. The 28-foot first-stage solid-fuel rocket motor weighed approximately 108,000 pounds and is capable of boosting the missile to about 75,000 feet. The 18-foot long second-stage motor propelled the missile to an altitude of about 190,000 feet and weighed 60,000 pounds. The rocket motor in the eight-foot third stage weighed 17,000 pounds and supplied the thrust to boost the missile to about 700,000 feet. The 2,300 pound post-boost fourth stage vehicle was designed to maneuver the missile into position for the multiple reentry vehicles to deploy in their respective ballistic trajectories. Following the burnout and separation of the boost system's third rocket stage, the post-boost vehicle system, in space, maneuvers the missile as its re-entry vehicles are deployed in sequence. The post-boost vehicle system is made up of a maneuvering rocket, and a guidance and control system. The vehicle rides atop the boost system, weighs about 3,000 pounds (1,363 kilograms) and is 4 feet (1.21 meters) long. The top section of the Peacekeeper is the re-entry system. It consists of the deployment module, up to 10 cone-shaped re-entry vehicles and a protective shroud. The shroud protects the re-entry vehicles during ascent. It is topped with a nose cap, containing a rocket motor to separate it from the deployment module. The deployment module provides structural support for the re-entry vehicles and carries the electronics needed to activate and deploy them. The vehicles are covered with material to protect them during re-entry through the atmosphere to their targets and are mechanically attached to the deployment module. The attachments are unlatched by gas pressure from an explosive cartridge broken by small, exploding bolts, which free the re-entry vehicles, allowing them to separate from the deployment module with minimum disturbance. Each deployed re-entry vehicle follows a ballistic path to its target. The Peacekeeper was the first U.S. ICBM to use cold launch technology. The missile was placed inside a canister and loaded into the launch facility. When launched, high-pressure steam ejected the canister from the launch silo to an altitude of 150 to 300 feet, and once the missile has cleared the silo, the first stage ignited and sent the missile on its course. 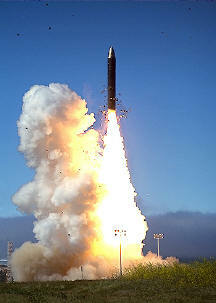 This technique allowed SAC to launch the Peacekeeper from Minuteman silos despite the fact that the Peacekeeper was three times larger than the Minuteman III.